Orthodontic treatments have come a long way in the last few decades. With all of the options available and the technological advances within the industry, the number orthodontic treatments have skyrocketed. According to the American Association of Orthodontists more than 4.8 million Americans have braces; 78% of which being under the age of 18. Today, “getting braces” is often seen as a rite of passage to adolescence. But what exactly is the appropriate age for your son or daughter to get braces? This article will help you determine if your child needs orthodontic treatment, and if so, when to get braces! As your child loses his or her baby teeth and begins to grow permanent teeth, take a close look at the alignment of the teeth coming in. If your child’s teeth are crowded, misplaced, protruding, or mis-aligned in any way, it’s a good bet that your son or daughter will need braces. Many people assume that braces are only used for cosmetic purposes and while a straight smile can often boost confidence and appearance, braces are used for health reasons as well. Straight teeth allow your child to bite and chew much more effectively, but most importantly, they’re easier to brush and floss. Additionally, crooked teeth put excessive pressure on the gums, which can lead to serious dental problems in the future such as gingivitis and gum disease. The American Association of Orthodontists recommends that kids have their first orthodontic assessment at age seven. At this age, most kids have enough permanent teeth to determine if orthodontic treatments will be beneficial to the health and appearance of their smile. It is also at this age when severe orthodontic problems, such as an underbite, overbite, narrow jaw, or serious crowding begin to emerge. If this is the case for your child, he or she may benefit from “early intervention” before the age of 10 to begin to correct the teeth and guide the jaws while they are still growing. This first phase of orthodontic treatment can vary depending on the problem that needs correction. In the case of a narrow jaw, an orthodontist might use a palatal expander to widen the upper jaw. Most kids who get early orthodontic treatment often go through a second round of braces when all of their permanent teeth are in, usually in their teens. If your son or daughter has a full set of crooked adult teeth, now is the time to pay a visit to the orthodontist. You can expect all permanent teeth to be grown in by age 14, however your child could be ready for braces as early as age 8. Over time, teeth become more rigid in their placement, so the earlier your son or daughter gets started with orthodontic treatments, the better the results. The average young adult wears braces for 1-2 years, however this can vary depending on the severity of the problems, treatments needed, and age. 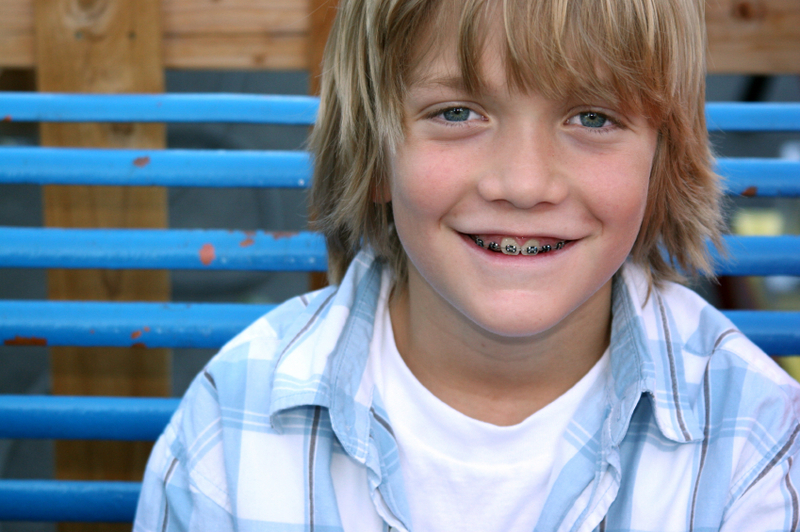 Once the braces are removed, don’t let your son or daughter forget to wear a retainer! This will prevent teeth from shifting back to their original, crooked positions. This entry was posted in Orthodontics and tagged Braces, Orthodontics, When to get braces. Bookmark the permalink. Follow any comments here with the RSS feed for this post. Both comments and trackbacks are currently closed.